The comprehensive reference, now completely up-to-date for Excel 2013! As the standard for spreadsheet applications, Excel is used worldwide - but it's not always user-friendly. 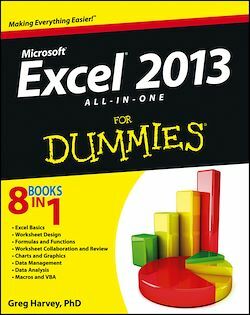 However, in the hands of veteran bestselling author Greg Harvey, Excel gets a whole lot easier to understand! This handy all-in-one guide covers all the essentials, the new features, how to analyze data with Excel, and much more. The featured minibooks address Excel basics, worksheet design, formulas and functions, worksheet collaboration and review, charts and graphics, data management, data analysis, and Excel and VBA. Whether you're an Excel newbie or a veteran user to wants to get familiar with the latest version, Excel 2013 All-in-One For Dummies has everything you need to know.